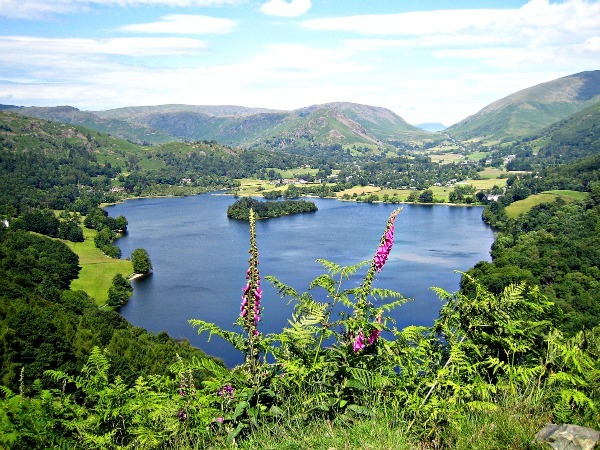 Grasmere has been enchanting visitors for centuries, and it is easy to see why. There is most definitely something very romantic about Grasmere village. In fact we stayed here on our honeymoon over twenty years ago, it was January and we practically had the place to ourselves. However a word of caution! If you arrive in Grasmere in the depths of the 'peak holiday season' you are likely to come away with an impression of swarming pavements and tourist buses rather than the tranquil ambience that inspired Wordsworth. Don't despair think of it this way: what's great about day-trippers is that is they tend to stick to the pavements that and the fact that the locals of Cumbria do rely on tourists to make a living. This site is about finding the spots that the shoppers and gift-shop tourists miss read our top tip of how to park in Grasmere during peak season. If you are tied to school holidays and want to visit Grasmere then the biggest hurdle you have to jump is the queue of traffic which backs seemingly all the way to Ambleside. Our top tip is to book accommodation (with parking space!) in Grasmere itself. Meaning that you only have to queue once at the beginning of your holiday and once at the end. Don't feel limited by this option. See it as your way to have a relaxing and eco-friendly holiday. Use Grasmere as your base, there is so much to do here and places to eat without having to move your car! Walks galore, of course, including the idyllic Easedale Tarn mentioned below. You can also hire a boat from Faeryland to row on the lake and of course a trip to Grasmere would not be complete without sampling the famous Grasmere Gingerbread and step back in time at Dove Cottage and Allan Bank. Plus you get Grasmere all to yourself when the day trippers have gone home. Easedale Tarn may no longer be Cumbria's best kept secret, but it is away from most of the crowds and and is an easy delightful walk. William & Dorothy Wordsworth home is open to the public and includes family activities to keep younger minds occupied whilst Adults soak in the historical. The garden is very much how it would have been when Dorothy and William lived there. A kind of semi-wilderness or what one might call a real cottage garden, with local plants, mosses and lichens in addition to edibles and cottage perennials. Grasmere Church is perhaps most famous for being the final resting place of Wordsworth. St. Oswald's holds a traditional 'Rushbearing Ceremony' here each year. This Grasmere rushbearing custom originally started before the laying of flagstones in the church. Now the ceremony takes the place of a village parade with local children carrying rushes through the village before they are strewn on the church floor. Traditionally each rush bearer receives a piece of gingerbread. Sarah Nelson's fabulous gingerbread is one of the reasons I am continually drawn back to this pretty Lakeland Village. The cottage is steeped in history. You will find it just past the church - follow the smell, or look for the queue! The recipe is a closely guarded secret as many TV interviewers and celebrities have found out!